I wish. But in the meantime, there is the just released Busby Berkeley Collection, which packages together five of the visionary's greatest works: Footlight Parade (1933), Gold Diggers of 1933, Dames (1934), Gold Diggers of 1935, and 42nd Street (1933). And it's got everything: dancing skyscrapers; gravity-defying pianos in deterrestrialized spaces; abstracted, disembodied, and dematerialized nubile bodies; ornamental, self-organizing crowds; Depression-era urbanism; hotels and arcadian watering holes teeming with pre-Code connubial bliss; Renaissance perspectives on acid; phantasmagorical stage sets; and a bitchless Bette Davis. You'll feel like singing and dancing afterwards. Marvelous! oooh, neato. I love these types of musicals. So cool! They're the best! Pity they are no longer being made. 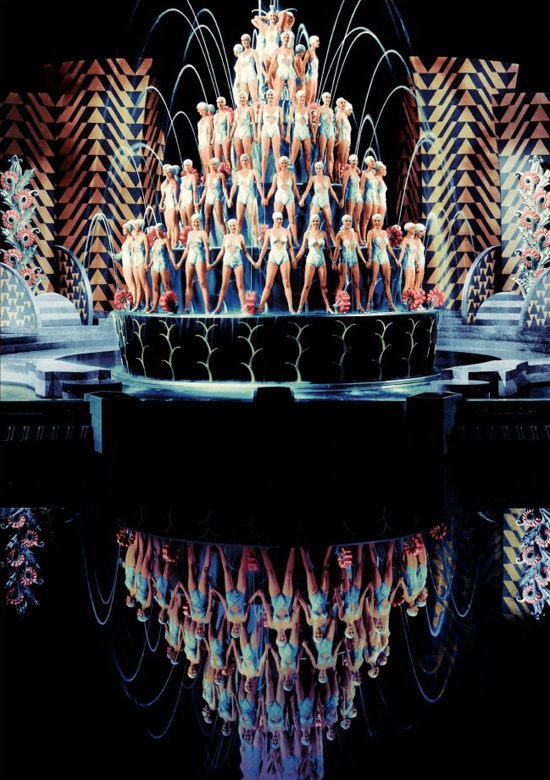 But fortunately, if we are prepared to be amazed, let go of skepticism and cynicism, we can encounter Busby Berkeley everywhere in the landscape. Meanwhile, there are some landscape architects and architects that have yet to acknowledge Berkeley's influence in their own works. For instance, this biomorphic sculpture from Gold Diggers of '33 and LA-based Frank Gehry's BP Bridge at Chicago's Millennium Park. Yes? No? Or how about the organizational unity via repetition in so many contemporary landscape design? Not French regular gardens or Italian regular gardens or even Land Art artists. I say Carmen Miranda in the The Gang's All Here was their muse. Also, does Cai Guo-Qiang want to direct a Hollywood musical?